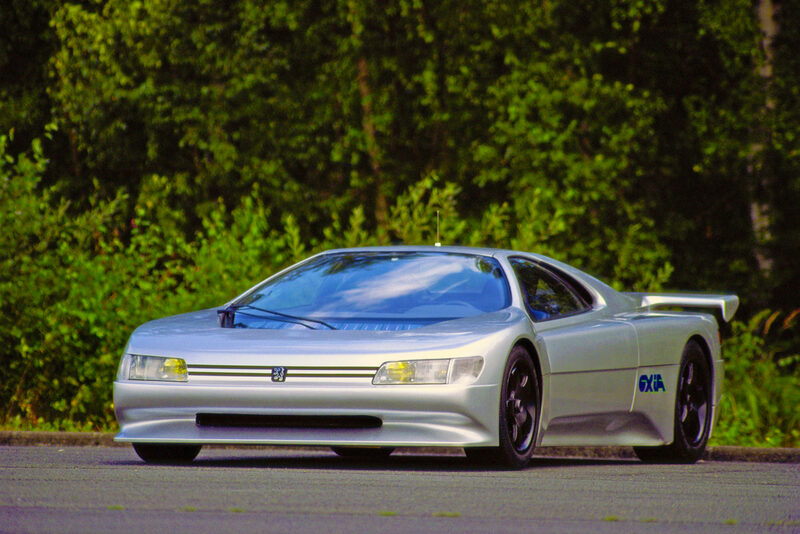 The incredible Peugeot Oxia prototype will be shown in public at the Concours of Elegance in Windsor for the first time in 25 years. Back in the late ’80s, Peugeot was on a bit of a roll. They had just finished off their bonkers Group B program with the winning mid-engined 205 T16, they were dominating long-distance rally raids and Pikes Peak, and their engines were powering the fastest endurance racecars to ever lap Le Mans. The decision was taken to create a GT concept car to express this sporting success. The result was the Oxia designed by Gérard Welter (exterior) and Paul Bracq (interior). It had a drag coefficient of 0.32 and was powered by a transversally mounted mid twin-turbo 2,849 cc V6 petrol engine producing a whopping 670 horsepower at an ear-splitting 8200 rpm. And a top speed of over 200 miles per hour. To maximise the performance available it was equipped with a permanent four-wheel-drive system, four-wheel steering, a six-speed gearbox, electronically controlled axle differentials and automatic tyre pressure monitors. The Concours of Elegance 2016 is a rare opportunity to see this incredible Peugeot in the flesh, and running, alongside some of the world’s most incredible cars from throughout history.